Hotel Miramar San Juan Puerto Rico - Just minutes from Old San Juan, Cruise Ships, PR Convention Center, Nightlife, Casinos & Beaches! Modern, clean design and neutral tones slow the pace when you’re ready to unwind. 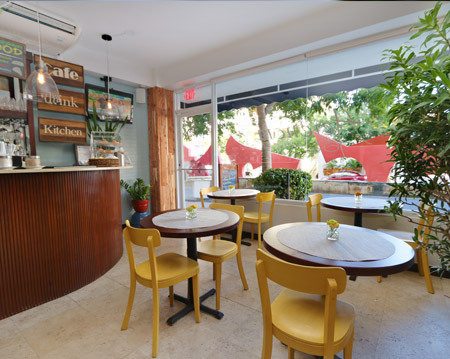 Creative Café & Bar at the Miramar Hotel in San Juan. Taste the creations of our Chef. Taste the Culinary Heritage of Puerto Rico. Our lobby café and bar is a casual space located in the lobby of the hotel with direct street access. 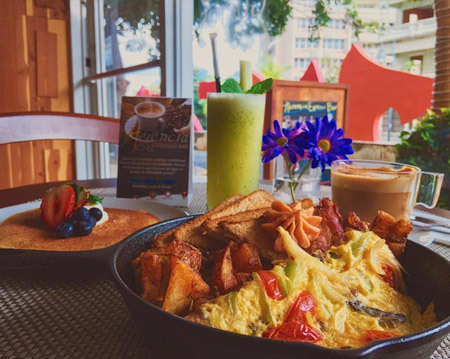 Alongside the best island coffees, we offer a select menu for breakfast and light bites on the go during the day up to closing time. 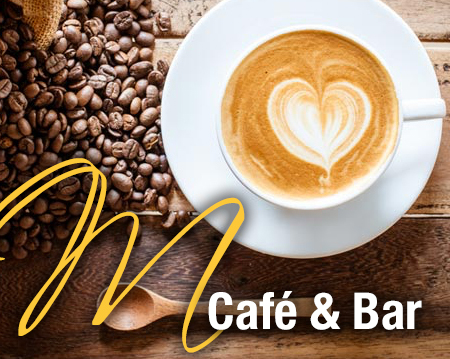 M Café & Bar offers two distinct areas. The Espresso Bar, located right of the entrance with street frontage to Ponce de León Avenue, features a long counter with a state of the arts Rancillo espresso machine, pastry display and beautiful mahogany custom design cabinets offering the finest liquors and spirits. 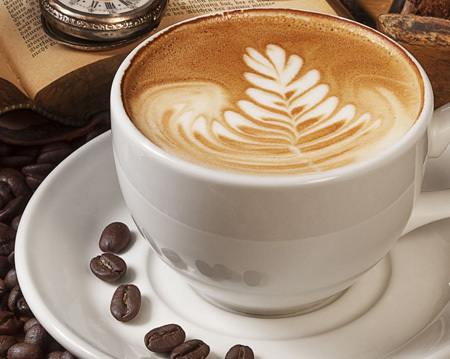 We serve the finest Puerto Rican coffee, harvested by hand in the western mountains of Yauco and Adjuntas. This unique space also features a wall mural of an early 20th century portrait of the site currently occupied by the hotel and bar and displays photographs of that era. The espresso bar provides sitting space for 16 patrons and serves an array of breakfast items including pastries and sandwiches. In the evening in addition to enjoying a fine cup of flavored coffee, hotel guests can also enjoy a refreshing cocktail, a glass of wine or a cold local beer. 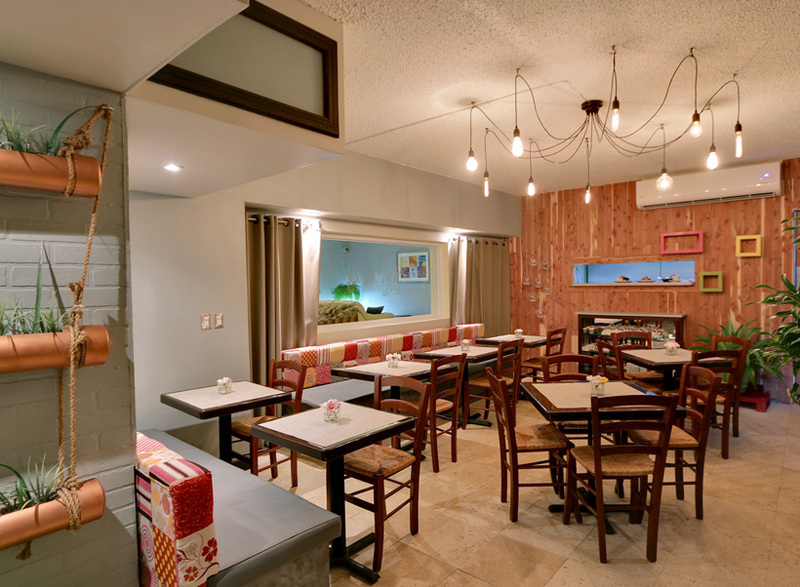 In the rear of the espresso bar there is a yet another cozy intimate space that sits up to 24 persons. The area opens in its lateral sides to panoramic windows facing local artist Nadja de la Torre’s urban art work covered wall in the driveway and on the right side a view into the hotel’s quiet lobby and business lounge and its center piece mural by Phillipe Lacroix. Both spaces provide a quiet and relaxing space where to work while enjoying a snack and beverage during the day and during the evening. The Hotel Miramar is proud to be associated with Casa de Todos, a home for abused and orphaned children ages 2-12 located in the town of Juncos, Puerto Rico. We donate 100% of all dessert sales to this institution. Please ask our server for details and our daily dessert. If you would like additional information or would like to contribute directly visit their website at www.casadetodos.org. San Juan, Puerto Rico's Best Value Hotel - just minutes from Old San Juan, Cruise Ships, PR Convention Center, Nightlife, Casinos & Beaches!. A charming 50 room boutique hotel with European style, ambiance and attention to detail overlooking the Condado Lagoon - close to everything!